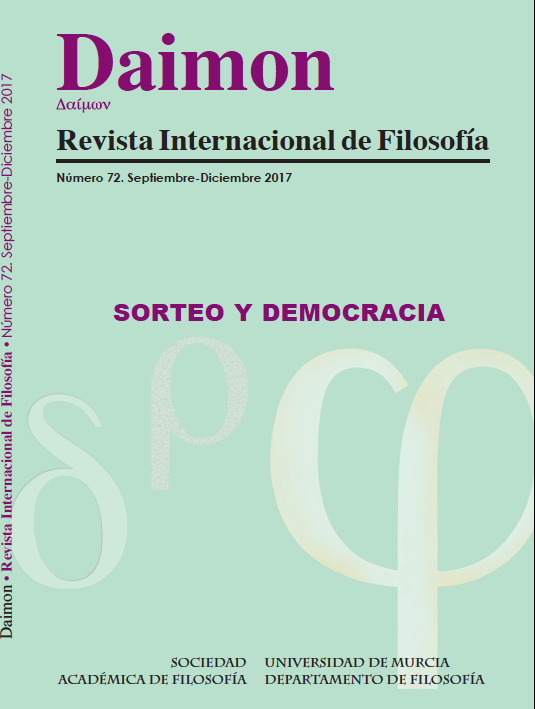 La democracia ateniense se enmarca desde los orígenes en una comunidad territorial, religiosa, política y arquitectónica. Sus instituciones son bien conocidas por los textos y la arqueología ha puesto al descubierto vestigios de lugares y edificios que permitieron su aplicación. En el marco de este artículo nos preguntaremos si la democracia ateniense se dotó de edificios y de herramientas específicos y, si tal fuere el caso, cómo su hallazgo, en vinculación con los datos proporcionados por los textos permitió avanzar en el conocimiento de su funcionamiento y determinó etapas relevantes en la escritura de su historia. BISHOP, J. D. (1970): « The Cleroterium », JHS 90, Cambridge University Press, London, pp. 1-14. BOEGEHOLD, Alan. L.; CAMP, John McKesson; CROSBY, Margaret; LANG, Mabel (1995): The Athenian Agora, vol. XXVIII, The Lawcourts at Athens, sites, buildings, equipment, procedure, and testimonia, The American School of Classical Studies, Princeton. CAMP, John McKesson (2015): « Excavations in the Athenian Agora, 2008–2012 », Hesperia 84.3, The American School of Classical Studies, Athens, pp. 467-513. CAMP, John McKesson; MAUZY Craig. A. (2009): The Athenian Agora. New perspectives on an Ancient site, Zaberns Bildbände zur Archäologie, Mainz. CAMP, John McKesson (1998): The Athenian Agora: Excavations in the Heart of Classical Athens, Thames and Hudson, London, 1998. CHANDLER, Richard (1806), Voyages dans l'Asie Mineure et en Grèce, II, trad. J.-P. Servois, Barbié du Bocage, Paris. CLINTON, Kevin (2005) : Eleusis : the inscriptions on stone : documents of the sanctuary of the two goddesses and public documents of the deme, vol. IA (text)-IB (plates), Archaeological Society at Athens, Athènes. DONTAS, George S. (1983):« The True Aglaurion », Hesperia 52, The American School of Classical Studies, Athens, pp. 48-63. DOW, Sterling (1937): Prytaneis: a Study of the Inscriptions Honoring the Athenian Councillors, Hesperia Suppl. I, The American School of Classical Studies, Athens. FORSDYKE, Sara (2005): Exile, Ostracism, and Democracy: The Politics of Expulsion in Ancient Greece, Princeton University Press, Princeton. HANSEN, Mogens Herman (2003) : La démocratie athénienne à l'époque de Démosthène. Structure, principes et idéologie, Les Belles Lettres, Paris (1a ed. en inglés en 1991). KROLL, John H. (1972): Athenian Bronze Allotment Plates, Harvard University Press, Cambridge Massachusetts. LANG, Mabel (1990): The Athenian Agora, vol. XXV, Ostraka, The American School of Classical Studies, Princeton. LIPOLLIS, Enzo (2006): « Lo spazio per votare e altre note di topografia sulle Agorai di Atene », ASAA 84-1, Bretschneider, Roma, pp. 37-61. LIPOLLIS, Enzo (en prensa): « Riunioni, operazioni di voto e agoni nell’agorà di Atene », in BORLENGHI Aldo; CHILLET Clément ; HOLLARD Virginie ; LOPEZ-RABATEL Liliane ; MORETTI Jean-Charles (dir), Voter dans l’Antiquité: pratiques, lieux et finalités en Grèce, à Rome et en Gaule, Maison de l’Orient et de la Méditerranée, Lyon, pp. 85-106. LOPEZ-RABATEL Liliane (2011), Klèrôtèria. Le tirage au sort dans le monde grec : machines, institutions et usages, 2 vol., tesis doctoral, Université Lyon 2 (inédita). LOPEZ-RABATEL Liliane (en prensa a): « Le vote dans le monde grec: procédures et équipement », in BORLENGHI Aldo; CHILLET Clément; HOLLARD Virginie; LOPEZ-RABATEL Liliane; MORETTI Jean-Charles (dir), Voter dans l’Antiquité: pratiques, lieux et finalités en Grèce, à Rome et en Gaule, Maison de l’Orient et de la Méditerranée, Lyon, pp. 53-84. LOPEZ-RABATEL Liliane (en prensa b): « Mots et outils du tirage au sort », in Lopez-Rabatel Liliane; Sintomer Yves: Tirage au sort et démocratie. Pratiques, instruments, théories. La Découverte, coll. Recherches, Paris. LESLIE SHEAR, Theodore (1994), « Ἰσονόμους τʹ Ἀθήνας ἐποιησάτην : The Agora and the Democracy » in COULSON William D. E., PALAGIA Olga (éds), LESLIE SHEAR Theodore: The Archaeology of Athens and Attica under the democracy: proceedings of an international conference ..., held at the American School of classical studies at Athens, December 4-6, 1992, Oxford. MAUZY Craig, Agora Excavations 1931-2006, A pictorial history, p. 9, The American School of Classical Studies at Athens, Athènes, 2006. MARTIN, Roland (1951): Recherches sur l'agora grecque, 1951, de Boccard, Paris. MERITT, Benjamin Dean ; TRAILL S. John (1974): The Athenian Agora: Results of Excavations, vol XV, Inscriptions : The Athenian Councillors, The American School of Classical Studies, Princeton. Miller, Stephen Gaylord (1978): The Prytaneion : its function and architectural form. University of California press, Berkeley-Los Angeles-London. Miller, Stephen Gaylord (1995): « Architecture as Evidence for the Identity of the Early Polis », in HANSEN, Mogens Herman; Copenhagen Polis Centre, Sources for the Ancient Greek City-State, Symposium August, 24-27 1994, Acts of the Copenhagen Polis Centre, Copenhagen-Munksgaard. MORETTI, Jean-Charles (en prensa): « La Pnyx, lieu de vote », in BORLENGHI Aldo; CHILLET Clément ; HOLLARD Virginie ; LOPEZ-RABATEL Liliane ; MORETTI Jean-Charles (dir), Voter dans l’Antiquité: pratiques, lieux et finalités en Grèce, à Rome et en Gaule, Maison de l’Orient et de la Méditerranée, Lyon, pp. 107-127. OIKONOMIDES, Al. Nicolaos (1964): The Two agoras in ancient Athens : a new commentary on their history and development : Topography and monuments, Argonaut Inc., Chicago, pp. 1-50: The agora in the old town). STAVELEY E. Stuart (1972): Greek and Roman voting and Elections, Cornell University Press, Ithaca-New York. THOMPSON Homer A., WYCHERLEY Richard Ernest (1972) : The Athenian Agora: Results of Excavations, vol. XIV, The Agora of Athens : the history, shape and uses of an ancient city center, The American School of Classical Studies, Princeton. TOWNSEND Rhys. F. (1995) : The Athenian Agora: Results of Excavations, vol. XXVII, The East side of the Agora, The remains beneath the Stoa of Attalos, The American School of Classical Studies, Princeton. VALAVANIS, Panos (1999) : Hysplex. The Starting Mechanism in Ancient Stadia. A Contribution to Ancient Greek Technology, Translated from the Greek and with an Appendix by Stephen G. Miller, University of California Publications, Classical Studies 36, University of California Press, Berkeley - Los Angeles – London. WOODHEAD, A. Geoffrey (1997), The Athenian Agora: Results of Excavations vol. XV, Inscriptions : the decrees in The Athenian Agora, The American School of Classical Studies, Princeton. WYCHERLEY Richard Ernest (1957): The Athenian Agora: Results of Excavations, vol. III, Testimonia : Literary and Epigraphical Testimonia, The American School of Classical Studies, Princeton.